Titan Fitness is a renowned company who is very dedicated on providing high quality fitness equipment towards it valuable customers. From many years, this company has reputed its name not only by manufacturing superior piece of equipment but also giving an exceptional customer service which is very hard to found. They want their customer to be completely satisfied with their product and have such experience that automatically spread the name of Titan Fitness to friends and family. Producing equipment such as dumbbells, weight machines, cardiovascular machines, kettle bells, power lifting, battle ropes, barbell and many other fitness accessories are been crafted by best engineers around the word to make the user do a rightful investment and have such experience that will lead him to come back in future too. If you are looking for an affordable, yet a high quality barbell for home or commercial gym, then Titan Fitness 60” barbell is the best fit for you. The bar comes with great features and benefits that makes it simply outstanding from the rest. The weight of the barbell is 25 pounds while having a weight capacity of 500 pounds. The length of the barbell is 60 inches while the diameter of it is two inches. There is a space between sleeves or what say a shaft length of 36.5 inches. The bar has the ability to fit standard weight plates with a diameter of two inches. The bar is constructed with pure steel and have a finish of Chrome on it. 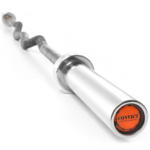 The handles are moderately knurled to let the barbell properly fit in your hand. There is also a titan fitness symbol present on the end cap of the barbell. Making it very convenient for bench press, curls, cleans, snatches and more. 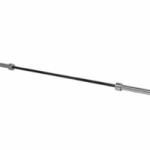 This 5 feet or 60” barbell by Titan Fitness is an Olympic weight bar which is very compatible and convenient to use at home or commercial gym. The bar is constructed using heavy metal steel with a hard chrome finish on it. The chrome is expensive yet the best because it prevents the bar from rusting way better than black oxide or zinc coating. The oxidation rate of chrome is very less, making it compatible to be used in humid regions. Also you won’t be needing to maintain the bar regularly because Chrome is considered as maintenance free. The bar has a dimeter of two inches which is one of the standard dimensions of barbell and can fit any standard Olympic weight plates very easily. The standard diameter will let you to buy weight plates that are coming within your range except of buying the expensive weight set by renowned companies. Having a grip area of diameter 1.1” is also an important factor of this bar because it lets you easily adjust your hand on the knurl which helps you to lift weight properly and securely. 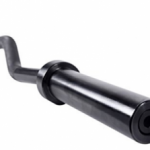 The knurling done on the barbell is very moderate along with dual knurl IPF marks that let you comfortably adjust your hand while lifting heavy weight set. There is no chance of digging on your hand because of the knurl, if you are still too curious about the marks then it is preferred to use gloves while lifting. There might be a chance of disliking of knurl by professional weightlifters, as they prefer a more aggressive type of knurl. The barbell is essential and used for curls, bench press, deadlifts, squats and many more exercises.Titan fitness barbell has the ability to withstand weight up to 500 pounds. Therefore, with a bar weight of only 25 pounds, this is a pretty massive number to bear which Titan fitness barbell’s do with ease. Having a heavy duty construction and hard chrome finish, it is still recommended to properly maintain and clean the barbell to keep the design and look as it is, for a longer period of time. So for that, a light coat of ointment, known as WD-40 and three in one oil are preferred to increase Titan Fitness Bar life span. The spin of the barbell is quite good due to bras bushings. The bar produces a very smooth and repetitive spin on lighter and moderate weight but the spin essentially decreases if you load up the barbell more than 350 pounds. Hence, in a low priced bar these small issue can be over looked. Having a low tensile strength makes this barbell very whipper. Making it very easily to perform deadlifts and cleans. Thus, having no center knurl and large whip, this bar is not recommended for squats. 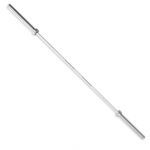 The affordability of this barbell is further assisted with free shipping. The barbell comes in good packaging on which every part and component are properly packed and delivered. 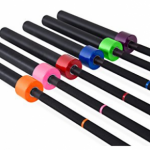 Titan fitness follows a policy of providing high quality customer service, so they ship the barbell within two working days. The bar have a weight of 25 pounds with a weight capacity of 500 pounds. The length of the barbell is Sixty inches. The diameter of the barbell is two inches which is kept very standard. The dual knurl marks are with respect to IPF standards. The material used to construct this barbell is pure steel. Coating of hard chrome is done to prevent the barbell from rust and corrosion. Consist of 1.1 inches grip diameter to properly adjust your hands on it. The barbell is constructed in USA. 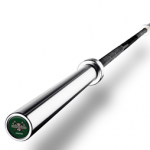 In my opinion, the Titan Fitness 60 inches barbell comes in the category of most affordable barbells that provide extensive quality, durability and functionality. 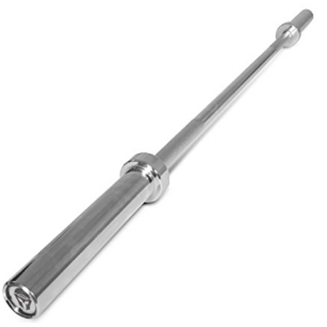 I purchased this barbell due to its affordability and its eye warming chrome plating looks. Having free shipping cost, the barbell arrived on my doorstep within two days and the packaging done was really impressive. The barbell looked very fresh with no damages and scratches on it. I quickly loaded some weight plates and started working out. The feel of the knurling was very comfortable, which adjusted on my hands very quickly. The spin was very repetitive which released a lot of pressure from my wrist and let me to perform curls and dead lift, way too easily. The bar was very whippy which led me to do cleans very firmly with great focus. The only problem I had with this barbell was its low weight capacity. Overall, this barbell is a piece of art which is recommended for everyone to have it. The barbell is very affordable. Constructed with high quality that can handle wear and tear of regular gym abuse. 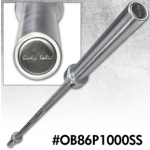 The chrome coating gives a very shiny look and prevents the bar from rust and corrosion. The dual knurl marks lets your properly adjust your hands on the bar. Loading and unloading of weight place is very smooth and easy. Warranty isn’t included with the barbell. The weight capacity of the barbell is very less and professional weight lifters won’t really prefer to buy it. The spin of the bar is very less in heavy weight set.